In addition to two skilled veterinarians, Colony Animal Hospital is proud to have a team of veterinary staff to provide your pet with quality care and provide you with quality customer service. Click on the headers below to learn more about our staff. If you have any questions or would like to make an appointment, feel free to let us know! Jane is the practice coordinator at Colony Animal Hospital and has worked alongside her husband, Dr. Greg Piske, since 1998. She earned an Associate of Applied Science degree in Veterinary Medical Technology in North Carolina. She is also a graduate of the American Animal Hospital Association’s (AAHA) educational program, The Veterinary Management School. She is a member of AAHA and the Veterinary Hospital Managers Association, which allows her to gain the most current information in veterinary medicine. With her 30+ years in the field, she loves that every day is unique and includes a wide array of pets. She also has a deep commitment to making the hospital and staff successful. Jane and her husband are proud parents of two adult sons, Matthew and Andrew, and they now have a granddaughter, too. Her four-legged family includes an Airedale named Moe, a Skye terrier named Teddy, a cat named Oliver, and a Dutch Warmblood named Finn. When she’s not helping patients, clients, and staff at work, she enjoys traveling, horseback riding, and crafting. A graduate of the University of South Carolina, Stewart began working at Colony Animal Hospital in February of 2014. She always wanted to work in an animal-related field, which is what led her to her position at Colony. As the assistant practice coordinator, she enjoys being part of a veterinary hospital and all the hard work, keeping pets and their owners happy. She also loves seeing the close bond that her clients have with their pets and the many learning opportunities that come with her position. Stewart has a red golden retriever named Bodhi and in her spare time, she enjoys spending time with horses (her favorite animal) and digging in her garden. Growing up, Sharon has always loved animals and in high school she took a job as a kennel assistant at a veterinary clinic. She worked her way up the ranks in the clinic as well as pursued an education, receiving a Bachelor’s degree in Animal Science from the University of Kentucky and an Associate’s degree in Veterinary Technology from Northern Virginia Community College. After college, she also worked for a little while training horses! As an LVT, she continues to work hard to further develop her skills in the veterinary field. Her pets at home include Feather, a Beagle mix, Henry, a Quarter horse, and Graycee a three-legged cat. In her spare time, she enjoys reading (her favorite book is Black Beauty), finding treasures in thrift stores, horseback riding, and crafting. Sarah received a Bachelor’s degree in Psychology with a minor in Biology from Christopher Newport University. Yet, she always had a love of animals and wanted to work with them. She is proud to have rescued many dogs and wildlife including birds, squirrels, and turtles from the roads over the years! Before starting her job here, she volunteered with animals at the Virginia Living Museum. As a veterinary assistant, she loves working with so many amazing animals and people! At home, she has two snowflake Clownfish, Reya and Rhys, as well as two Dachshunds, Loki and Thor. When she is not working, she likes to watch movies, read, nap, and play games. Casey started her academic career majoring in Engineering, but then decided against that path and is very happy with her current career! She received an Associate of Science in Veterinary Medical Technology from Lincoln Memorial University in Tennessee. Her favorite part of her job is seeing improvement in the animals she’s treated and watching them grow and live healthy lives. She also very much enjoys getting to know the client base here! At home, she has two pets, Arlo a pug-chihuahua mix and Rafael a domestic long hair cat. She also loves eating Mexican and Japanese food, reading, photography and traveling! Unfortunately, after years of waiting, Jessica never received her acceptance letter to Hogwarts, so instead, she turned to her other passion: animals. She grew up watching Steve Irwin on Animal Plant and seeing his positive impact on the world inspired her to pursue a career working with animals. She has a lot of experience, too. She worked at an equestrian clinic, volunteered at animal shelters, and even worked at a llama farm for four years. In fact, one of her greatest achievements is learning the language of llamas! It wasn’t until she had her daughter, Rylee (who is 3 and loves to dance), that she made her first step to becoming a veterinary assistant and truly finding a career that she loves. Jessica’s favorite part of her job is seeing an owner’s face after realizing that their fur baby is going to be okay. At home, she has two pets of her own, Oliver, “Ollie,” a Shetland Sheep Dog and Blue, a Domestic Short Hair cat. In her spare time, she also enjoys going on adventures, writing short stories, reading comics (her favorite is Spider Man), and watching movies. Miranda has always known that she wanted to work with animals—in preschool, she cried so hard when Bubbles from the Powerpuff Girls couldn’t keep a whale as a pet that she had to go home. She loves helping animals be well again, and is particularly proud of helping her adopted, partially paralyzed dog, Beau, walk again. He does pretty well now when he has traction! She also has other pets including Evie, a Yorkie mix, Luloo a Savannah cat mix, and Snow White, a dove. In her spare time, she enjoys napping and watching horror movies. Ardra has always dreamed of working with animals and helping as many of them as she can. That’s why she’s dedicated her life to their care! She aims to provide the utmost care for any animal as if they were hers. In fact, she has three pets of her own: Star and Binx, her two cats, and Marley, her chihuahua mix dog. When not at work, she loves to spend time with her fiancé, Kris Dicker, as well as going to auctions and antique shops with her parents. She also enjoys movies, and her favorites are Back to the Future and The Nightmare Before Christmas. 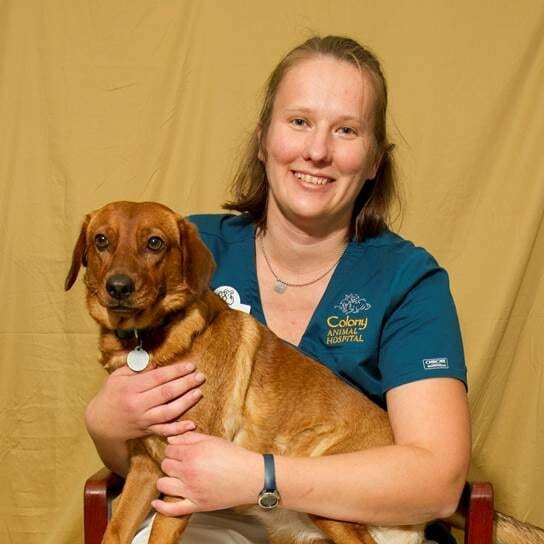 Brianne is a dedicated kennel assistant who is certified in small animal science and technology and ACT kennel assistant training, and has also completed a veterinary science course, all at New Horizons Regional Education Center. Working with animals is her dream job and she loves getting to know each animal’s personality while making them safe and comfortable during their stay. Brianne loves all animals, but has a special passion for small animals like guinea pigs. She is planning on continuing her career in veterinary medicine by attending tech school in order to become a licensed veterinary technician. At home, Brianne has 3 pets of her own: a Shih Tzu named Harley as well as two guinea pigs named Ellie and Zoey. When she’s not working, she enjoys spending time with her animals and her family, as well as taking trips to the beach! Kayt has always loved animals and wanted to work with them. She started out at a boarding facility during college, then moved to an animal shelter after college, and finally decided she wanted to work on the medical side of things. She earned her veterinary assistant certification from Penn Foster and loves caring for the animals at our clinic! Kayt has four pets of her own at home, including three Chihuahua mixes named Ted, Chico, and Lucy, as well as her three-legged cat, Robin. When she is not working, she likes reading, practicing yoga, being out of the house, and spending time with her family (including the furry ones). Her greatest achievement is going any length of time without being bitten by a grumpy pet! Caitlin began her career in human medicine and she worked as a certified nursing assistant in South Carolina for some time. However, she has always had a love for animals and wanted to further her education towards veterinary medicine, she began working as a kennel assistant with all types of animals. Then she relocated and has been working with us as a receptionist. She loves welcoming new families and their pets to our animal hospital. One of her greatest achievements in veterinary medicine in getting her mom’s Lab, Riley, to be heartworm negative, since he was positive when they adopted him! When she is not working, Caitlin enjoys traveling with her significant other, Nathan, and their two dogs, Bella, a Golden Retriever/Collie mix and Hazel, a German Shepherd. She also has two ferrets at home, Charlotte and Griffen. After working many years as a retail manager, Dianne decided to finally pursue her passion and dream to work with animals of all different breeds! As a receptionist, she loves interacting with the clients and their pets, and building relationships with both. Some of her greatest achievements include completing a 100-mile bike ride, the Tour de Cure and the Shamrock Half Marathon, as well as rescuing her dog who was at the shelter 10 months before she got him! Her pets at home include her Rottweiler/Lab mix, Reesie, and her tuxedo cat, Katie. When she is not working, she enjoys reading, running, and spending time at the beach. Pauli started her academic career as a pre-dental major, but then fell in love with all the class pets in her Biology classes, so switched to a biology major to focus more on animals. She also volunteered at an animal shelter, worked as an assistant at a day practice and an emergency clinic, then came to work with us in June 2017! She loves helping educate clients and working with them to make the lives of their pets the best they can be! She is most proud of an achievement outside of work: she helped trained her parents’ two deaf Dalmatians, Frankenstein and Marshmallow, sign language commands, totaling about 25 commands! At home, Pauli has two pets of her own including Maggie a Cocker Spaniel, and Sheldon a Russian Tortoise. In her free time, she enjoys taking Maggie to the beach and spending time with her significant other, Jonathan.